Version Control is used to manage the changes to documents, computer programs, web sites, and other collections of information. What is Version Control Good For? Git is a program that resides on our computers. When used on a project, it creates a database locally that stores our code and changes that we've made to it over time. That local database is called a "local repository"
We also have the ability to send these changes to other places, so that other developers can pull this code to their own computers and make their own modifications to it, and then merge it back up to that place. The place that we send the code is called the "remote repository"
The table below has all of the key words from this diagram bolded. Let's go through this list of commands, and see what they do on a conceptual level. Add (stage) all edited files in the current directory git add . Commit (save) a version into the local repository git commit -m "message describing changes"
Instructor Note: Using the diagram, go through each of the above commands, and show what happens when we use them. Although this lesson will not be focusing on Github, we are going to set up a "remote repository". Click on the "+" icon in the header bar to the right. The distinguishment between Git and Github is very important. Git is the tool that we use to track and move our files. Github is simply where we are storing these files. Did your Shell Prompt change? What's happening here? What we did here is tell our local repository where our remote repository is located. $ git status                  # What is an untracked file? $ git commit -m "Added 2 files." We have saved those changes into our local repository. Now that we have saved these changes to the local repository, we can replicate, or "push" these same changes to a git repository located somewheres else. The syntax for this is: git push <remote> <branch>, the "git push" command wants to know two things, where to send the changes, and which branch to send it down. The remote we named "origin" that we added earlier is this address, and "master" is our default branch. Instructor note: view these changes up on github, show what happened once we pushed our code. What if we want to build a feature into our program, but we don't want it to be in our main code until it's perfecto? What if two developers are working on two seperate things that could conflict with eachother at the same time? Instructor note: draw and explain this timeline on the board. As Git monitors the changes we have made over time to our software, we can model it in our heads as a timeline, like such above, with each dot across the timeline being a commit to the code. By default, when we create a repository, we are given one branch by default that git monitors our changes on, this is called the master branch, you can think of this as the main timeline of our code's history. this command will create a new branch in git, and then switch to that branch, all in one command. Cloning Repositories So far we have set up our repository from scratch, however, this isn't always the case. Sometimes we want to take an existing remote repository and bring it onto our computer locally. The last thing we will do in this lesson is clone our WDI-10 class repo to our home directory in our filesystem. Can someone tell me what a Git Repository is? 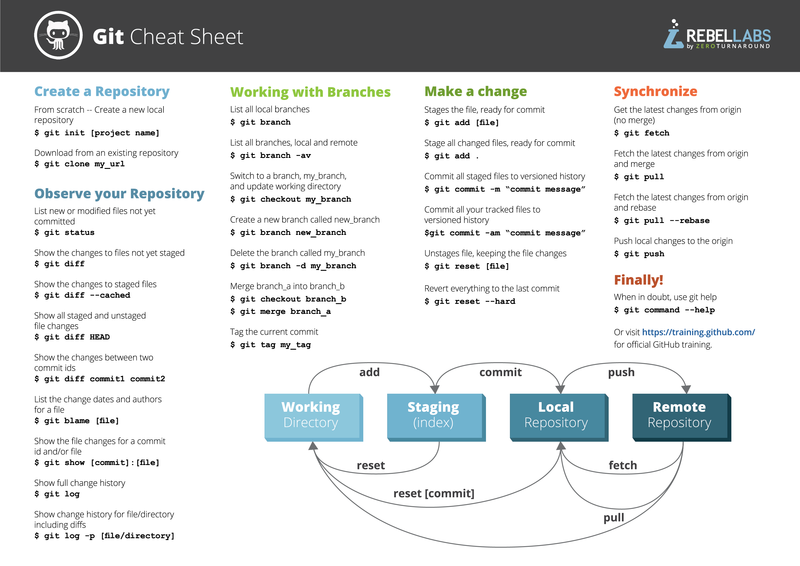 What are some key components of a Git repo?